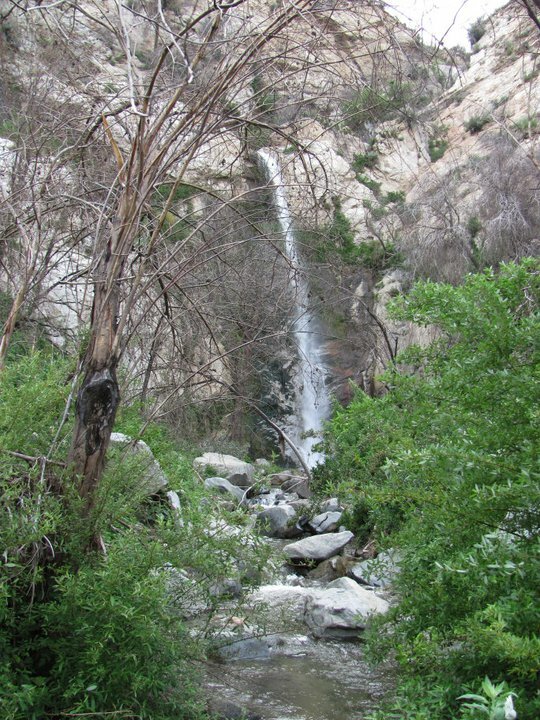 Falls Creek Falls is a seldom visited waterfall in the Los Angeles Forest about ten miles north of Sunland. The waterfall has five tiers and is over 120 feet tall. The trail to the falls features several smaller cascades that are great for photos. The trail starts on the left side of the road about ten miles North of Sunland on Big Tujunga Canyon Road. The entrance and parking area is less than a mile north of the Big Tujunga Canyon reservoir overlook at a locked gate on the left hand side. There is ample parking room for at least 5 or 6 cars. The Trail was an old road called Falls Creek Road which was closed in the 1980’s due to weather damage. From the locked gate, there is approximately 2 miles of a steep descent on a wide road with loose gravel and a few patches of weeds and boulders, but nothing too difficult. The trail is cut into the mountain and you get a beautiful view of the river as you hike down into the canyon. We ran into a small green snake on the trail, but he slithered off when he heard us coming. After a mile a half, the waterfall will be visible from the trail. This is your only opportunity to photograph it in its entirety because the upper tiers are not visible from the base of the falls. 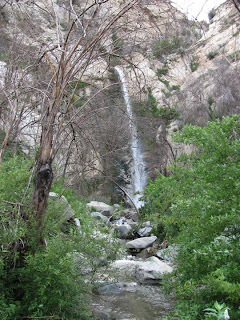 In addition to the main 5 tier waterfall, you will pass 2-3 other small cascading waterfalls on the trail. Once you reach the the creek, you leave the trail and hike about a half mile downstream through wide flat part of the creek to the base of the falls. We opted to avoid jumping on the rocky shoreline and walked in the creek with the current. The creek was quite calm and had a sandy base which made it easy to walk in. The base of the falls is less than half a mile downstream. The last 100 yards of the hike may require some tricky footwork on the loose stones and little bushwacking, but the reward is definitely worth the effort. There is a small pool at the base of the falls which is about 2 1/2 feet deep and a bit too small for swimming. Even though we’ve had almost no rain this month, the falls were really flowing hard. From the base of the falls you might be tempted to climb the canyon to get a better look at the upper tiers, but I would not advise attempting to do any climbing without bring some serious rock climbing gear because the cliffs are sandy and loose. The hike back up to the car was the only tough aspect of the hike. There are several other waterfalls located in this canyon which I have not explored.